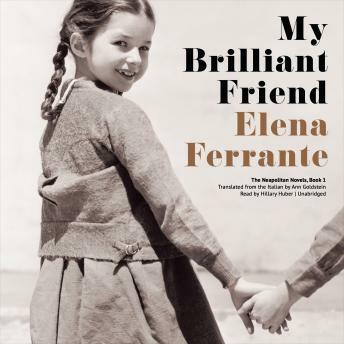 With My Brilliant Friend, the first in a trilogy, Ferrante proves herself to be one of Italy’s greatest storytellers. She has given her readers a masterfully plotted page-turner, abundant and generous in its narrative details and characterizations—a stylish work of literary fiction destined to delight her many fans and win new readers to her work. I loved this book, the characters, the prose, and style of writing. Though at times the booked moved slowly, the words were so rich in detail and description that it was worth the initial quieter pace to reach a plot crescendo. We have traveled extensively in Italy and also have distant relatives still living there; this book explains so much of of the family and social values that are there yet somewhat hidden in it's culture and society. It reminded me very much of the American Classic book "A Tree Grows in Brooklyn". Could not wait to start the 2nd book in this series. Also found the narrator's pacing and voice changes when needed were very well done. Highly recommend!! Amazing book and the audio book way better!!! The expressions the narrator had and how she spoke, amazing! I loved this book. The characters grow on one. I can't wait to get the next one! Loved the story, couldn’t stop listening! I also liked the narrator though I know some people don’t. I just finished the first book and immediately bought the next in the series. I was urged to read this book as I live on the island of Ischia which is referenced at various stages. Although I found the book and the narration very engaging at times, my overall feeling was one of disappointment. I knew that this wouldn't be a book with much "action" so to speak but I was surprised by how few actual events occurred. The main emphasis centres around perceptions of relationships and the growing pains (physical and mental) of a young girl growing up in Naples. I do understand why the books are so revered but this really isn't a genre that I enjoy and I won't be listening to the other books in the series. I thought the narrator was fairly good though. Good narrator and good book. They fit well together. Great narration and telling of this story. I read the text to nearly the end but then finished via audio. I highly recommend the story. I enjoyed the story, but I found the narrator spoiled it. She was trying to act out the characters, but her acting was pretentious and they all sounded the same. It would be much better if she just stuck to reading the story clearly. Also she read to fast at times.